George is a male English/Domestic cross who came into rescue in April 2018. 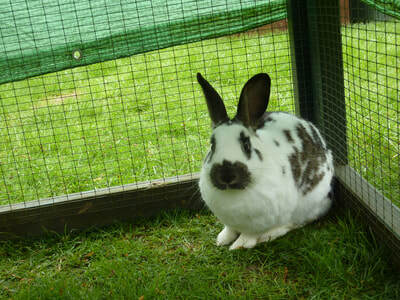 He is neutered & we were advised by their previous owner that they are around 3 years old. George has also been vaccinated (nobivac & filavac) & microchipped. George was a little overweight when he came to us in April but has now lost weight & is looking better as a result. The 2 photos with the very green grass were taken in April & the other 2 in October. We have tried to bond George with 4 different females now & the bondings have not been successful. 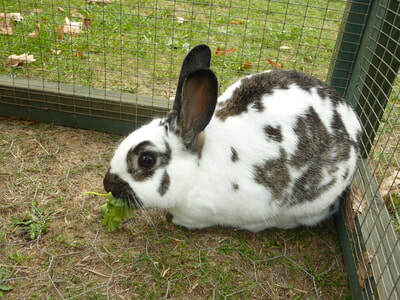 Unfortunately, George is a bit rough when he is grooming & all the female rabbits we have tried him with have not liked this! 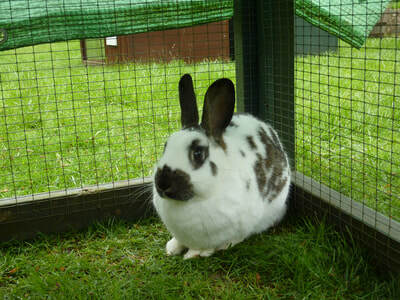 For this reason, we have now decided that we need to rehome George on his own as a house rabbit. George’s new owner will need to be at home with her for most of the day - he could be left on his own for a maximum of 4-5 hours, but no longer.